One way of promoting home brew knowledge is to join or create a home brew club. There are stacks all over the country and having been to a fair few meetings I can report that I have experienced a very warm welcome and a garage of new ideas. The organisers of BrewCon have a map of some clubs who they are aware of but its not got them all on, but google or facebook can help you find your nearest Club. “What is the collective noun for Home Brewers? A herd? A bushel? Apparently (according to Google) it is a Feast. Well there you go, educational post achieved, let’s crack on with the rest of it then! What is a Homebrew Club and why do I need one? 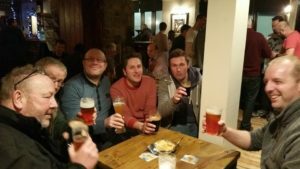 Essentially your local Homebrew club is a ‘Feast’ of like-minded home-brewery fanatics who want to get together, drink each other’s brews and chat about all things beer! You know that slightly glazed look that your significant other or friends start to take on as you explain the importance of hop Alpha Acids or the benefits of precise temperature-controlled fermentation when brewing lagers? Well that’s nowhere to be seen and you can finally talk a language that most, if not all, the other people around the table can fully understand! 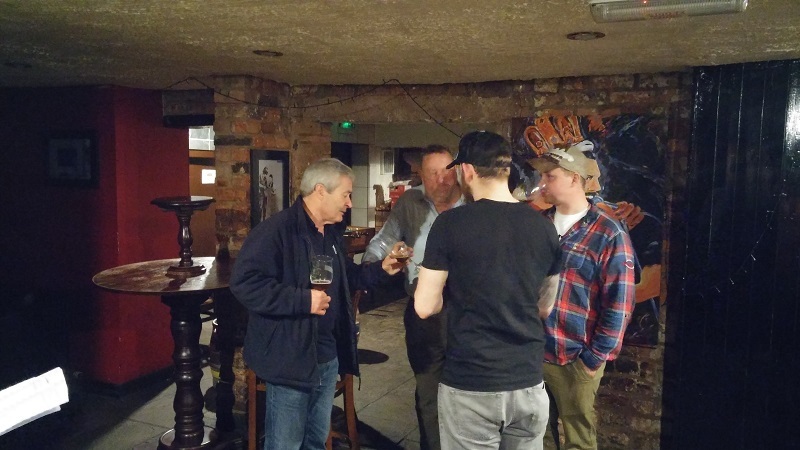 These generally take place in the basement room of The Cellar Bar, Chester on the last Thursday of the month and take the form of an informal tasting session. Brewers bring along and show off their latest creations, talk through the recipes and the techniques used, and tap into the collective knowledge of the group to work through any issues that may have been experienced. Beers will be drunk and constructively criticised, often with hints and tips thrown in for good measure with ways to improve, rectify, or tweak the end product, and of course when a Brew comes along with no input required all the samplers can sit back, appreciate a job well done and start planting the inspirational seeds for their own version to be brewed in the future! We normally have between 5-10 attendees at each meeting, each bringing one or two brews to the table, so that’s a lot of beer to get through! It’s a tough ask I know! 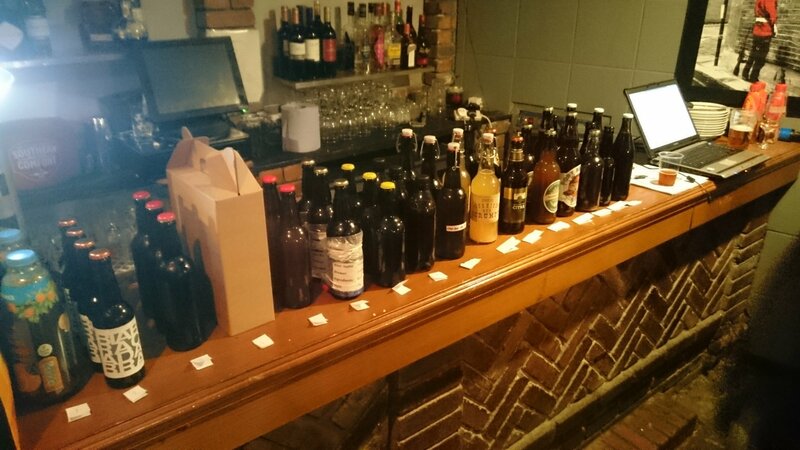 As a club we also hold an annual brewing competition, Recipe Roulette, which pitches our members and the members of other local clubs against each other to top prizes! We have found the greater brewing community to be a very generous bunch who are willing to donate both big and small prizes into the pot to help reward the very best beer the brewers can create. This year’s competition winner will win the opportunity to brew their recipe on a commercial scale at a local craft brewery and see it on sale in their local bars! Other clubs I know hold smaller but more regular competitions, monthly themed brews, host collective Club Brewdays together, and organise Brewery Tours for their members to attend and enjoy. So now I’ve sold you on the benefits, how can you find out about your local Homebrew club? Unfortunately, there isn’t a definitive list of UK clubs that I’m aware of. Most clubs will have an information thread on all the usual homebrewing forums, a Facebook page, a Twitter account, etc so a quick burst of Google searching should find you what you’re looking for. Brewdog pubs, Craft Beer Bars and local Homebrew shops often host their own Homebrew clubs or at least might know of one in the area so it’s worth asking around there too. Failing that, if you think there is enough interest in your town, you can start your own! All you need is a couple of people, an understanding host venue and a selection of beers! If you haven’t thought about joining a Homebrew club before I strongly recommend you check out your local one. We aren’t elitist in anyway and whether you’re an established All Grain, Extract or Kit brewer or even if you’ve never opening a packet of hops in anger and just want to see what all the fuss is about you will be welcomed with raised glasses! If you are in the Cheshire area and want to come and check out the Cheshire Brew Crew, please check out our website www.cheshirebrewcrew.co.uk or our social media pages for details of our future meets and pop me a message if you have any questions! If you have something interesting or useful that you’d like to add to our blog like Ben has, then just drop us an e-mail, as we’d love to help you help other home brewers.